Red Planet Hotels (formerly Tune Hotel) are known for their cheap rates and excellent location. While Red Planet Malate offers one of the most competitive rates down South, Red Planet Aseana has the best location of them all. 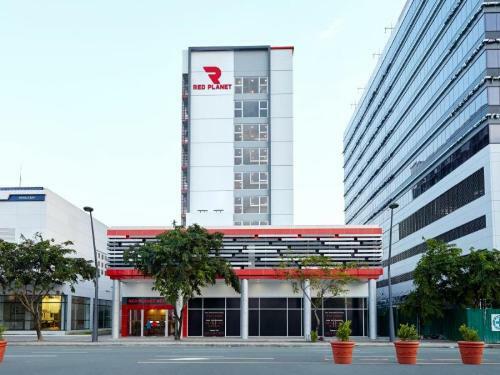 Located along Bradco Avenue and across S&R Macapagal, the hotel is just a 5-minute ride away from the Mall of Asia and about 10 minutes from the airport. Room Tip: Always request for the rooms on the high floors so you'll get a good night's sleep as the roads below can be very busy. On the upside, its an easy commute whether you're taking a cab or riding a bus or jeep going around the Metro. Our room had a view of Baclaran and Airport Road. All rooms in Red Planet are standard air-conditioned rooms and have the same size and design, it only varies on the bed configuration if you prefer a twin or double bed. Rooms are equipped with an LCD television with cable channels, a private toilet and bath with basic toiletries, a hair blower attached beside the mirror and bedside tables for your gadgets and other valuables. The double bed is large enough to fit two adults and is actually very comfortable. So if you're looking for a place to stay to catch your early morning flight out of Manila or a place to crash especially now that the rainy season (aka flood season) has arrived, Red Planet Aseana is the perfect hotel for your accommodation needs that surely fits the budget.